All applications will be accepted from April 15, 2019 through June 15, 2019. Letter of interest in participating in Remembrance | Memorial | Monument. 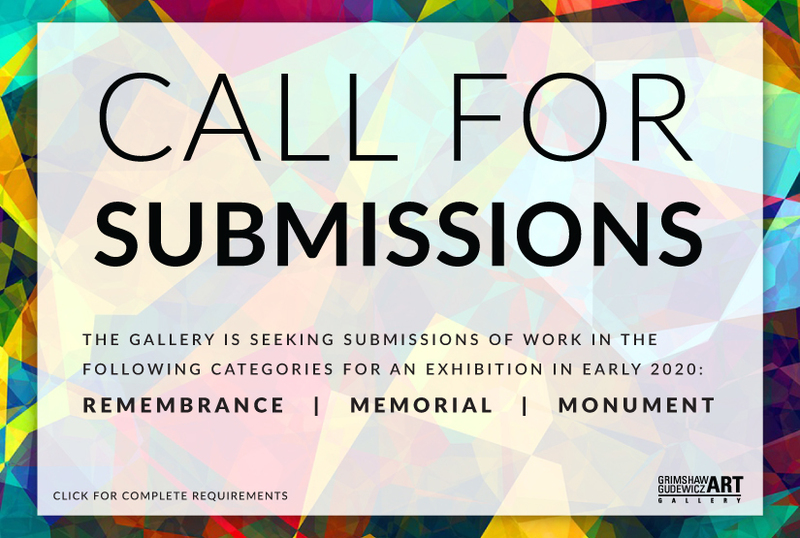 Each artist may submit up to three original works completed within the last five years. Artists may submit only one digital images of each work, plus one detail, for a total of six possible images. All images must be high resolution, JPEG format (minimum size of 300 dpi and 4 x 6 inches). Sound artists must submit samples of work in MP3 format and performance-based works submitted via links to a video streaming site such as Vimeo or YouTube. by the Grimshaw-Gudewicz Art Gallery curatorial staff. Artists will be selected based on an evaluation of their submitted materials. All submissions must be accurate representations of the work. Notifications of acceptance will be made via email by midnight on August 1, 2019.